I hope you all enjoyed the break or used the time to catch up a little. Stitch 12 for Take a Stitch Tuesday 2019 is to learn and experiment with Cretan Stitch. 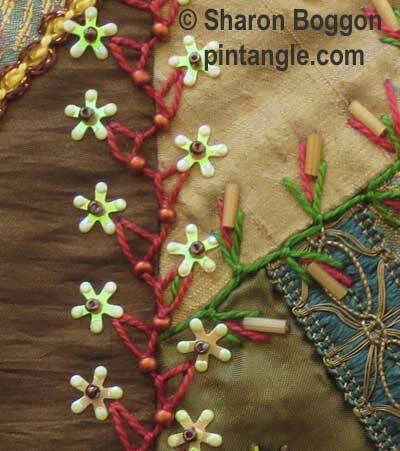 Cretan stitch is another of those key stitches people learn when they are new to hand embroidery. As I have said before, the first 15- 20 weeks or so of TAST is effectively an embroidery course suitable for beginners to take, so I hope those readers who are attempting this stitch for the first time enjoy it and discover its versatility. Click through to the instructions, for more eye candy and to give you ideas on how to use the stitch. 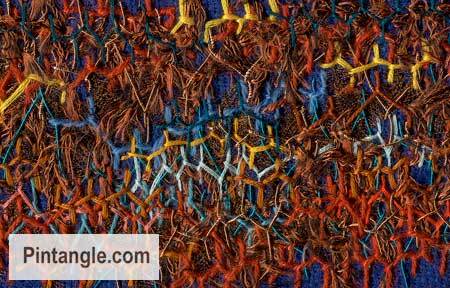 Beyond TAST this week is a favourite quirky stitch. Looped Cretan Stitch is unusual and a doozie of a stitch if you add a bead! I like stitches that look a bit different. Not only does it make for an interesting border, if you work it row upon row it also makes a really interesting pattern fill. Crazy quilters will love this stitch as it makes a great seam embellishment but it is also a wonderful border stitch too. I am really interested to see what you make of this stitch. If you are new to hand embroidery, the challenge is to learn the stitch and share what you have learnt. If you are an experienced embroiderer, enjoy Beyond TAST and give your work a modern twist and share it online so beginners can see what can be done with a little imagination. Stitch a sample, photograph it, put in online on your blog, or share it in the TAST facebook group or where ever you hang out online. Hashtags are #TASTembroidery and #PintangleTAST on places like Instagram etc. 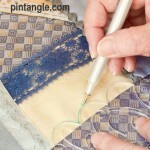 If you have a blog leave a comment on the Cretan Stitch stitch page or the Looped Cretan Stitch stitch page.